Once upon a time, fantasy was a wild thing that knew no borders. All human cultures had their mythologies and imaginations. It was more than a genre. Then came the Nineteen Sixties. Hippies discovered Tolkien. Later, hobbit-like computer geeks went gaga for fantasy role-playing games. Publishers and the entertainment industry (that hadn’t quite gone corporate and global yet) saw wizards and dragons as profit-getters. Fantasy became stereotyped into an official, commercial genre. And for some reason it went ridiculously Anglo. England became an extension of Middle Earth, imagined from watching reruns from the BBC, instead of a real place. Angry young Chicano writer that I was, I complained, but nobody listened. Years went by, the new century arrived. Tolkien was made into movies, bikers and affluent black kids discovered him. Families of hillbillies learned to play Dungeons & Dragons. And now, the post-Harry Potter audience loves Game of Thrones. So I tend to sneer at things labeled Fantasy by the mulitnational corporate entertainment industrial complex, even though I love all things fantastic. Then I met K Arsenault Rivera, was impressed with her feisty attitude and her proud declaration that her first novel was about “incredibly gay princesses.” She was also born in Mayaguez, Puerto Rico, moved to New York when she was a toddler, and currently lives in Brooklyn. I had a feeling that the La Bloga audience needed to know about her. So I bought a copy of The Tiger’s Daughter. The bio said she was involved in the role-playing community, but I could forgive her that because of her obsession with Homer’s Odyssey with feminist objections. 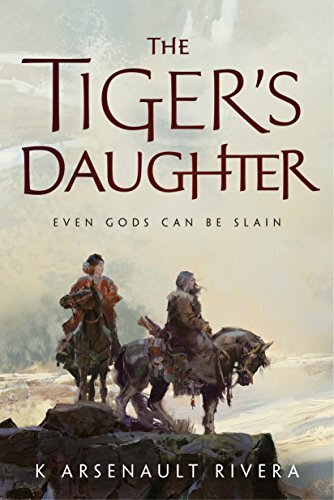 The Tiger’s Daughter not only delivers incredibly gay princesses (Disney take note), but a well-crafted fantasy world based on the Mongolian empire. There are demons that have armies, and are the result of a zombie-like plague, but are not the cliches from that overdone subgenre that refuses to die. We also get a powerful love story that includes love letters (I miss letters, we lost something with the coming of email)--in fact, the whole novel seems to be a long love letter. And an epic adventure. Never does it come off as being contrived to pander to contemporary tastes or sensibilities. I felt that I was transported to another world. Isn’t that what fantasy is supposed to do? It sure ain’t macho fanboy fodder. Still, it’s been trolled on Goodreads. Racial slurs that are within the context of the world/story, even identified as such, are called out as being politically incorrect. Rivera has also been accused of cultural appropriation because she isn’t Asian. Who came up with this idiotic idea that we all are only supposed to write our own ethnic group? Doesn’t that put ridiculous limits on or imaginations? It can also cripple science fiction and fantasy worse that racism does. We shouldn’t be afraid to let our twisted imaginations go wild. Especially us Latinoids, who tend to be natural-born recombizoids whether we like it or not. But then Rivera doesn’t need me to tell her that, or defend her, warrior that she is. Ernest Hogan, author of Smoking Mirror Blues, will pick the winner of the First Annual Somos en Escrito Extra-Fiction Writing Contest 2018 (the deadline is September 30--enter now! 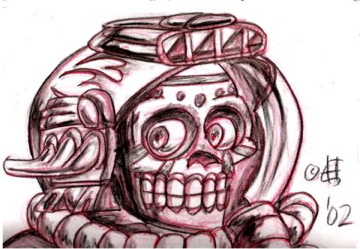 ), and have a story in upcoming anthology The Latinx Archive. Cultural appropriation? PC high brow hogwash. Definitely on my must read list.